When exercising, knowing several statistics about your workout can help you determine whether you've reached your fitness goals for the day. 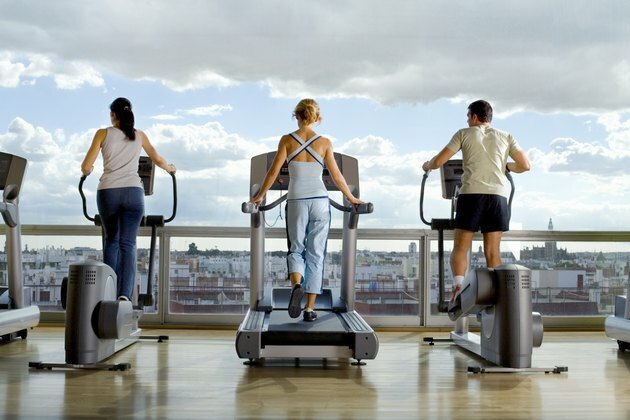 You might be interested in how many calories you've burned, for example, or how far you ran on the treadmill. For the most efficient workouts, track your heart rate and try to keep it within your target zone. Using pulse sensors built into many machines can help you determine your heart rate by reading it through your hands. Pulse sensors, also called heart rate sensors, find your pulse through the skin of your hands. The sensors often are silvery metallic areas located on the support bars or moving arm bars of exercise machines. Some have single large sensors on each side, while others have two on each side spaced closely together. They interpret small electrical signals passing through your skin and amplify them so they can turn those signals into numbers you can recognize -- the estimated number of times your heart is beating per minute. On most exercise machines, turning on the machine allows you to check your heart rate instantly, giving you an idea of your resting heart rate. In many cases, you grab the bars on the metallic sensors, ensuring your hands cover the sensors completely -- all the sensors, if the machine has two on each side. As you exercise, either leave your hands on the sensors to watch your heart rate increase or grab them periodically to check the rate. If the sensors aren't reading your heart rate, it might be because your hands are too dry or too wet, or they aren't positioned properly. Exercise machine pulse sensors provide an estimated heart rate, designed to give you a close approximation of the number. They tend to be fairly accurate, but for a more precise heart rate number, use a different type of monitor -- one that straps to your chest. These aren't included with many exercise machines, but you can purchase one or borrow one from the gym, if available. The chest-strap monitors provide continuous, accurate numbers, but they might not be comfortable to wear throughout your workout. When your exercise machine doesn't offer a pulse sensor or you want to verify its numbers, check your own heart rate the old-fashioned way. Place two fingers on the side of your neck or on the inside of your wrist until you feel your pulse. Look at a clock and count the number of pulses you feel in a 10-second span. Multiply that number by six for your heartbeats per minute. Your heart rate should stay between 50 and 85 percent of your maximum heart rate, which you find by subtracting your age from 220. So if you're 35, your maximum heart rate is 185. If you wanted to keep your target heart rate at 75 percent of that, your number to watch for would be 138 beats per minute. ABC News: How Accurate Are Exercise Machines?